We’d love your help. Let us know what’s wrong with this preview of Quite Honestly by John Mortimer. Thousands of readers have discovered the inimitable voice of John Mortimer through his Rumpole series of stories. 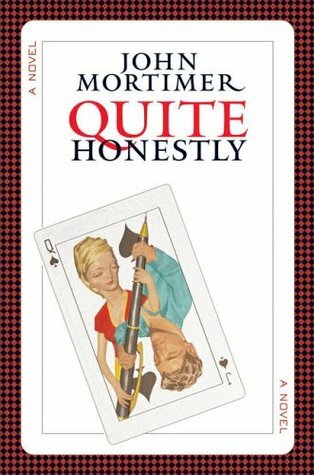 But with Quite Honestly, Mortimer creates a cast of characters that rivals his usual Rumpole repertoire, delivering a wonderfully comic novel, packed with entertaining reflections on a life in crime. Life couldn't be better for Lucinda Purefoy. She's got a steady boyfriend, a degree in social sciences from Manchester University, and the offer of a high-powered job in advertising. With all this good fortune, isn't it appropriate for her to give something back to society? With her newly minted membership in Social Carers, Reformers, and Praeceptors (SCRAP for short), an organization that recruits women to become the guides, philosophers, and friends to ex-convicts coming out of prison, Lucy finds herself standing outside the gates of Wormwood Scrubs waiting to greet a career burglar called Terry Keegan. What happens next- after a short and hostile trip to Burger King-confounds expectations and produces a signature Mortimer tale full of wit and surprise. To ask other readers questions about Quite Honestly, please sign up. Meh. Here's the story in a nutshell: Lucinda is a blithering idiot, the offspring of a mother who is mostly a lush most of the time, and a father who is a bishop in the Church of England, despite his oddly irreligious views. Lucinda graduates from college, blithering idiotness notwithstanding, and decides she should give back, do some good in the world. An annoying friend suggests she join a group who helps newly-released prisoners get re-established in the real world. Lucinda is assigned to Ter Meh. Here's the story in a nutshell: Lucinda is a blithering idiot, the offspring of a mother who is mostly a lush most of the time, and a father who is a bishop in the Church of England, despite his oddly irreligious views. Lucinda graduates from college, blithering idiotness notwithstanding, and decides she should give back, do some good in the world. An annoying friend suggests she join a group who helps newly-released prisoners get re-established in the real world. Lucinda is assigned to Terry, a reasonably handsome man who was born into crime and eventually went to jail for theft. Of course, Lucinda falls for Terry, and in an attempt to really understand him, she starts pilfering things from her friends when she's at house parties. Because she's an IDIOT. Terry, concerned about her future, tries to convince her to stop. She, being dumber than a load of bricks, thinks he's just not impressed with the small things she's taken so far, so she plans a bigger heist. Of course she gets caught, and the upshot of this colossal waste of time is that she goes to prison, and Terry goes straight. When she gets out, he will try to reform her. See that clever turnaround? If only I cared. I love the Rumple books and it probably isn't fair to compare. Just because an author writes one kind of book brilliantly, what right does his audience have to demand that all his books sparkle? None. Which is why I really should let JKR off the hook for disappointing with The Casual Vacancy, a perfectly ordinary but not horrid book that falls so far short of Harry the gulf couldn't be spanned by the Brooklyn Bridge. So, Quite Honestly is no Rumple. Still, I kind of loved it. Quite Honestly is un I love the Rumple books and it probably isn't fair to compare. Just because an author writes one kind of book brilliantly, what right does his audience have to demand that all his books sparkle? None. Which is why I really should let JKR off the hook for disappointing with The Casual Vacancy, a perfectly ordinary but not horrid book that falls so far short of Harry the gulf couldn't be spanned by the Brooklyn Bridge. So, Quite Honestly is no Rumple. Still, I kind of loved it. Quite Honestly is unambitious. It's a small story focusing on two pretty straightforward characters. It isn't deep or revelatory. But, this book is elegantly conceived and artfully executed. The writing is tight and the dialogue is convincing. I didn't laugh like I do when Rumple pokes me, but I still enjoyed this one end to end. I listened to the book on CD - 2 readers taking turns, whose solid performances enhanced the story. I might have enjoyed it more because I bought it at the dollar store on a whim and then had a good long plane ride to get settled into it, but it was sweet. The characters were sweet, the way of writing was JUST foreign enough that it was quirky, but not difficult... I'd have to call it "charming"... it was small, but not smarmy, not brilliant, not awful. It wasn't superfluous. I was compelled to keep going back to it to see how it wrapped up, and it wrapped up solid. Frivolous fun, good entertaining read. Well written froth, with plenty of humor, and a few pokes at the justice system. I actually read this through a second time, having read a several years ago (don't you hate it when you realize this?! ), and still enjoyed it. An amusing she said/he said comedy, where both the hard-line and soft approaches to law and religion are gently mocked. An enjoyable light comic read. Lagniappe: Several references to "Mad Bull" Bulligham and a cameo appearance by Mr. Frobisher. I really looked like a Brit on holiday while reading this book by the pool! It was predictable but OK. The UK writing style and language took some getting used to, but it wasn't terrible, just not my type of book. Life couldn't be better for Lucinda Purefoy: she's college educated with a steady boyfriend and a job offer in advertising. With all this good fortune, isn't it appropriate for her to give something back to society? Armed with only good intentions and her newly minted membership in Social Carers, Reformers and Praeceptors (SCARP, for short)--a misguided organization that recruits women to become guides, philosophers, and friends to ex-convicts coming out of prison--Lucy finds herself standing ou Life couldn't be better for Lucinda Purefoy: she's college educated with a steady boyfriend and a job offer in advertising. With all this good fortune, isn't it appropriate for her to give something back to society? Armed with only good intentions and her newly minted membership in Social Carers, Reformers and Praeceptors (SCARP, for short)--a misguided organization that recruits women to become guides, philosophers, and friends to ex-convicts coming out of prison--Lucy finds herself standing outside the gates of a jail, waiting to greet a career burglar named Terry Keegan. What happens next--after a short and hostile trip to Burger King--produces a signature Mortimer tale, full of wit and surprise. Lucy Purefoy is a woman on a mission to reform career criminal Terry. These two from the opposite of the tracks form a romantic relationship that comes with a twist. I am not sure what I was expecting with this book, but what I ended up with I am still puzzled over. Lucy, comes across as a stuck up do gooder, who flits from one romance to another. The meeting of Terry is meant be to something special but all I get is that she wants to know why he steals. There just did not seem to be a chemistry Lucy Purefoy is a woman on a mission to reform career criminal Terry. These two from the opposite of the tracks form a romantic relationship that comes with a twist. I am not sure what I was expecting with this book, but what I ended up with I am still puzzled over. Lucy, comes across as a stuck up do gooder, who flits from one romance to another. The meeting of Terry is meant be to something special but all I get is that she wants to know why he steals. There just did not seem to be a chemistry between the two. Terry comes across as bemused all the time and I never get a sense of who he really is. His transformation towards the end, I just did not believe it. There is wit, there is carefully constructed characters but after a while they are more cliched. Disappointing. Of course, hardly anything measures up to Rumpole, but this strange tale of a Sweet Young Thing doing good by trying to keep a Bad Boy Just Released from being returned to the nick was just so unlikely. Meh. I gave up in the middle of CD #3 and took up listening to ALL THE LIGHT WE CANNOT SEE on CD which I previously read in hardcover. I liked it so much, I probably sped through it and with CDs I have to slow down. I find myself returning to the beginning of a track to listen again Disappointing. Of course, hardly anything measures up to Rumpole, but this strange tale of a Sweet Young Thing doing good by trying to keep a Bad Boy Just Released from being returned to the nick was just so unlikely. Meh. Very different from the typical Mortimer / Rumpole mystery. Lucy is a 20-something do-gooder who becomes a volunteer for an organization that provides preceptors to ex-convicts. Her first client, Terry, is a thief with whom she falls in love and wants to fully understand. Her idea of empathy has unexpected results. Sort of a romantic comedy. Enjoyable but not great. A very late Mortimer and not his best. The structure of the plot which has the two principal characters gradually swapping places reminded me of Martin Amis’ ‘Success’, though this is a warm and forgiving novel, which no-one could say of Martin Amis’ stuff. Still, John Mortimer below his best is still a writer with whom it is enjoyable to spend time. Awful. No real story. Some Mortimer wit, but very little. Like written by one of his Rumpole characters, Claude Erskine Brown, say. Readable; not nearly as funny as advertised; a story of role reversal; it does kill time. I like the Rumpole books better. This one was, while amusingly written, very predictable. Just okay - nothing special or memorable. Certainly not a Rumpole - very different. She wanted to "do some good in the world", but is was a funny way of going about it! A light, easy-read, but not much depth and rather improbable in many places. I just got cross with her. And as for her father the Bishop - well, I've worked in the Church of England, and far-fetched just doesn't go nearly far enough! This was entertaining enough to warrant finishing, but this story lacked a little something. I think there was a chance for this to be a really great and fun little book, but it fell just short on all levels. I'm not mad that I read this book, but I don't think I would recommend it to anyone else or seek out other books by the author. An entertaining, plot driven book. This disposable thoughtless look at quirky people, their interesting relationships, and astounding 'britishness' was the right combination of movement and wit to make it worth an airplane read. Don't expect much. Mortimer offers offers separate views of an interaction between two people, one aimed at helping others and another coming out of prison in an current English setting. So far, their different perceptions are quite revealing and interesting. Not a Rumpole story, although still quite good. A few Rumpole stalwarts do make cameo appearances however. I loved Mortimer's earlier works, and Rumpole and his Chateau Thames Embankment are part of my everyday life. However, this novel was rather disappointing, and had it been by anyone else I would not have read past page 10. It was simply boring and rather dated. A quite witty look at social liberals and their misguided goals. Also a sting to the Church of England. Very enjoyable with very little foul language. This book is very light-reading!! It has light comedy and I was smiling till the end of the pages. John Clifford Mortimer was a novelist, playwright and former practising barrister. Among his many publications are several volumes of Rumpole stories and a trilogy of political novels, Paradise Postponed, Titmuss Regained and The Sound of Trumpets, featuring Leslie Titmuss - a character as brilliant as Rumpole. John Mortimer received a knighthood for his services to the arts in 1998. Rumpole John Clifford Mortimer was a novelist, playwright and former practising barrister. Among his many publications are several volumes of Rumpole stories and a trilogy of political novels, Paradise Postponed, Titmuss Regained and The Sound of Trumpets, featuring Leslie Titmuss - a character as brilliant as Rumpole. John Mortimer received a knighthood for his services to the arts in 1998.